1993-06-03 First worldwide family litigation filed litigation Critical https://patents.darts-ip.com/?family=27231527&utm_source=google_patent&utm_medium=platform_link&utm_campaign=public_patent_search&patent=EP0285389(A2) "Global patent litigation dataset” by Darts-ip is licensed under a Creative Commons Attribution 4.0 International License. Shampoos are disclosed which comprise a specific mixture of anionic synthetic surfactants, an insoluble, non-volatile silicone, a suspending agent and water. Such shampoos provide excellent cleaning and conditioning while still being mild. The present invention is related to mild, good cleaning conditioning shampoos which contain a dispersed, non-volatile silicone phase and are stabilized through the use of certain long chain materials. Human hair becomes soiled due to its contact with the surrounding atmosphere and, to a greater extent, from sebum secreted by the head. The build-up of the sebum causes the hair to have a dirty feel and an unattractive appearance. The soiling of the hair necessitates it being shampooed with frequent regularity. Shampooing the hair cleans by removing excess soil and sebum. However, the shampooing process has disadvantages in that the hair is left in a wet, tangled and generally unmanageable state. A variety of approaches have been developed to alleviate the after-shampoo problems. These range from the inclusion of hair conditioning aids in shampoos to post-shampoo application of hair conditioners, i.e., hair rinses. Hair rinses typically work by depositing a polymeric film or other material onto the hair. However, such solutions to a very prevalent problem have not been fully satisfactory. For one thing, hair rinses must be applied in a separate step following the shampooing, left on the hair for a length of time, and rinsed with fresh water. This, of course, is time consuming and is not convenient. While shampoos have been disclosed which contain conditioning aids, they have not been totally satisfactory for a variety of reasons. One problem relates to compatibility problems between good cleaning anionic surfactants and the fatty cationic agent which are good conditioning agents. This caused other surfactants such as nonionics, amphoterics and zwitterionics to be examined by workers in the field. Many of these efforts are reflected in patents issued in the conditioning shampoo area. See for example U.S. Patent 3,849,348, November 19, 1974 to Hewitt; U.S. Patent 3,990,991, November 9, 1961 to Gerstein; and U.S. Patent 3,811,312, July 2, 1974 to Sato. The use of these other surfactants solved many of the compatibility problems but still did not provide complete answers in all areas. For instance cationic conditioners may not deliver the desired level of softness desired by users. Materials which can provide increased softness are silicones, both those which are soluble as well as insoluble in the shampoo matrix. Silicones in shampoo compositions have been disclosed in a number of different publications. Such publications include U.S. Patent 2,826,551, March 11, 1958 to Geen; U.S. Patent 3,964,500, June 22, 1976 to Drakoff; U.S. Patent 4,364,837, December 21, 1982 to Pader; and British Patent 849,433, September 28, 1960 to Woolston. While these patents disclose silicone containing com­positions, they do not provide answers to all of the problems encountered in making a totally satisfactory product. One problem is that of keeping a dispersed, insoluble silicone material suspended and the total product stable. A second problem is related to making good cleaning, anionic surfactant based shampoos milder. An approach which has shown to be beneficial in suspending silicone material involves the use of long chaim acyl derivatives and other long chain derivatives. Such an approach is disclosed in published European Patent Application 0181773, published May 21, 1986 incorporated herein by reference. The present inventors having surprisingly found that by using a particular combination of alkyl ether sulfate and alkyl sulfate surfactants, shampoos which are milder than straight alkyl sulfate systems and yet lather well can be formed. It is an object of the present invention therefore to provide a stable silicone containing conditioning shampoo. It is a further object of the present invention to provide silicone shampoo compositions using anionic surfactants which lather well while being milder than straight alkyl sulfate sur­factant systems. It is a further object of the present invention to provide good cleaning, mild, conditioning, antidandruff shampoos. It is still a further object of the present invention to provide improved methods for cleaning hair. Unless otherwise indicated, all percentages and ratios wherein are by weight. The present invention relates to shampoo compositions comprising from about 10% to about 40% of a mixture of alkyl ether sulfate and alkyl sulfate surfactants, about 0.01% to about 10.0% of an insoluble, non-volatile silicone, about 0.5% to about 5.0% of a certain long chain derivative and water, wherein the molar ratio of alkyl ether sulfate to alkyl sulfate is from about 3:2 to about 6:1, preferably from about 2.5:1 to about 3.5:1. These as well as optional components are described in detail below. The essential components of the present invention are given in the following paragraphs. An essential component of the present compositions is a combination of surfactants. The surfactant mixture is present at a level of from about 10 to about 40%, preferably from about 10% to about 30%, most preferably from about 15% to about 22%. The surfactants used in the present compositions are ethoxylated alkyl sulfates and alkyl sulfates in a molar weight ratio of the former to the latter of from about 3:2 to about 6:1, preferably from about 2.5:1 to about 3.5:1. The ethoxylated alkyl sulfates are preferably the sodium, ammonium, potassium or triethanolomine salts of sulfuric acid esters of the reaction product of one mole of higher alcohols (e.g. C₈-C₁₈ carbon atoms, linear as well as branched) and one to eight moles of ethylene oxide. The alkyl sulfates can be exemplified by those prepared by sulfating the higher fatty alcohols (C₈-C₁₈ carbon atoms) and forming the sodium, potassium, ammonium, or triethanolomine salt. Specific preferred alkyl sulfates and ethoxylated alkyl sulfates are ammonium lauryl sulfate and ammonium laureth-3-sulfate. Silicone fluids are a suitable non-volatile silicone that may be used in the present compositions. The non-volatile silicone fluid may be either a polyalkyl siloxane, a polyaryl siloxane, a polyalkylaryl siloxane or a poly­ether siloxane copolymer and is present at a level of from about 0.01% to about 10% preferably from about 0.5% to about 3%. Mixtures of these fluids may also be used and are preferred in certain executions. The dispersed silicone particles should also be insoluble in the shampoo matrix. This is the meaning of "insoluble" as used hereinbefore and hereinafter. The essentially non-volatile polyalkyl siloxane fluids that may be used include, for example, polydimethyl siloxanes with vis­cosities ranging from about 5 to 600,000 centistokes at 25°C. These siloxanes are available, for example, from the General Electric Company as the Viscasil series and from Dow Corning as the Dow Corning 200 series. 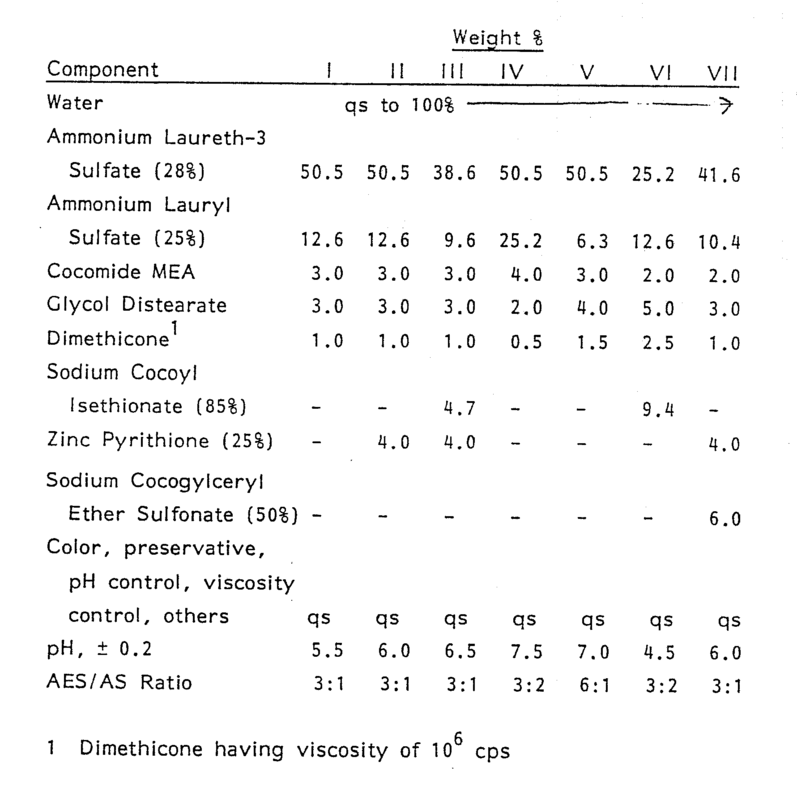 The viscosity can be measured by means of a glass capillary viscometer as set forth in Dow Corning Corporate Test Method CTM0004, July 10, 1970. Preferably the viscosity ranges from about 350 centistokes to about 100,000 centistokes. The essentially non-volatile polyalkylaryl siloxane fluids that may be used include, for example, polymethylphenylsiloxanes having viscosities of about 15 to 30,000 centistokes at 25°C. These siloxanes are available, for example, from the General Electric Company as SF 1075 methyl phenyl fluid or from Dow Corning as 556 Cosmetic Grade Fluid. The essentially non-volatile polyether siloxane copolymer that may be used is, for example, a polypropylene oxide modified dimethylpolysiloxane (e.g., Dow Corning DC-1248) although ethylene oxide or mixtures of ethylene oxide and propylene oxide may also be used. References disclosing suitable silicone fluids include the previously mentioned U.S. Patent 2,826,551 to Geen; U.S. Patent 3,964,500, June 22, 1976 to Drakoff; U.S. Patent 4,364,837 to Pader and British Patent 849,433 to Woolston. All of these patents are incorporated herein by reference. Also incorporated herein by reference is Silicon Compounds distributed by Petrarch Systems, Inc., 1984. This reference provides a very good listing of suitable silicone materials. Another silicone material found especially useful in the present compositions to provide good dry combing is a silicone gum. Silicone gums described by Petrarch and others including U.S. Patent 4,152,416, May 1, 1979 to Spitzer, et al. and Noll, Walter, Chemistry and Technology of Silicones, New York: Academic Press 1968. Also describing silicone gums are General Electric Silicone Rubber Product Data Sheets SE 30, SE 33, SE 54 and SE 76. All of these described references are incorporated herein by reference. "Silicone gum" materials denote high molecular weight polydiorganosiloxanes having a mass molecular weight of from about 200,000 to about 1,000,000. Specific examples include polydimethylsiloxane, (polydimethylsiloxane) (methylvinylsiloxane) copolymer, poly(dimethylsiloxane) (diphenyl) (methylvinylsiloxane) copolymer and mixtures thereof. The suspending agent useful in the present compositions can be any of several long chain acyl derivative materials or mixtures of such materials. Included are ethylene glycol esters of fatty acids having from about 16 to about 22 carbon atoms. Preferred are the ethylene glycol stearates, both mono and distearate, but particularly the distearate containing less than about 7% of the mono stearate. Other suspending agents found useful are alkanol amides of fatty acids, having from about 16 to about 22 carbon atoms, preferably about 16 to 18 carbon atoms. Preferred alkanol amides are stearic monoethanolamide, stearic diethanolamide, stearic monoisopropanolamide and stearic monoethanolamide stearate. Other long chain acyl derivatives include long chain esters of long chain fatty acids (e.g., stearyl stearate, cetyl palmitate, etc); glyceryl esters (e.g., glyceryl distearate) and long chain esters of long chain alkanol amides (e.g., stearamide DEA distearate). Still other suitable suspending agents are alkyl (C₁₆₋₂₂) dimethyl amine oxides such as stearyl dimethyl amine oxide. If the compositions contain an amine oxide or a long chain acyl derivative as a surfactant the suspending function could also be provided and additional suspending agent may not be needed if the level of those materials are at least the minimum level given below. The suspending agent is present at a level of from about 0.50% to about 5.0%, preferably from about 0.5% to about 3.0%. The suspending agent serves to assist in suspending the silicone material and may give pearlescence to the product. Mixtures of suspending agents are also suitable for use in the compositions of this invention. Water is the last essential component of the present invention and forms the remainder of the composition. It is generally present at a level of from about 20% to about 95%, preferably from about 60% to about 85%. The shampoo herein can contain a variety of non-essential optional components suitable for rendering such compositions more acceptable. Such conventional optional ingredients are well known to those skilled in the art, e.g., preservatives such as benzyl alcohol, methyl paraben, propyl paraben and imidazolidinyl urea; cationic surfactants such as cetyl trimethyl ammonium chloride, lauryl trimethyl ammonium chloride, tricetyl methyl ammonium chloride, stearyldimethyl benzyl ammonium chloride, and di(partially hydrogenated tallow) dimethylammonium chloride; thickeners and viscosity modifiers such as a diethanolamide of a long chain fatty acid (e.g., PEG 3 lauramide), block polymers of ethylene oxide and propylene oxide such as Pluronic F88 offered by BASF Wyandotte, ammonium xylene sulfonate, sodium chloride, sodium sulfate, polyvinyl alcohol, and ethyl alcohol; pH adjusting agents such as citric acid, succinic acid, phosphoric acid, sodium hydroxide, sodium carbonate, etc. ; perfumes; dyes; and, sequestering agents such as disodium ethylenediamine tetraacetate. Such agents generally are used individually at a level of from about 0.01% to about 10%, preferably from about 0.5% to about 5.0% by weight of the composition. Another optional component is an additional surfactant used in combination with the alkyl sulfate/ethoxylated alkyl sulfate mixture. Included among optional surfactants are the sodium alkyl glyceryl ether sulfonates; the reaction product of fatty acids having from 10 to 22 carbon atoms esterified with isethionic acid and neutralized with sodium hydroxide; water soluble salts of condensation products of fatty acids with sarcosine; among several others. The optional surfactants, collectively, can be used in any amount (molar amount) up to the molar amount of the alkyl sulfate ethoxylated alkyl sulfate blend. Still another optional component of the present invention is an antidandruff agent. Suitable agents include sulfur, selenium sulfide, salicylic acid, zinc pyridinethione, other 1-hydroxy pyridones, such as those disclosed in U.S. Patent No. 4,185,106, Jan. 22, 1980 to Dittmar et al, incorporated herein by reference and azole antimycotics, disclosed in British Patent No. 1,502,144, Feb. 22, 1978, incorporated herein by reference, among many others. The antidandruff agent is present at a level of from about 0.2% to about 4%. Zinc pyridinethione is the preferred agent, particularly where its salts crystals are predominantly flat platelets which have a mean sphericity less than about 0.65 preferably between about 0.20 and about 0.65, and a median particle diameter of at least about 2µ, expressed as the diameter of a sphere of equivalent volume. It is preferred that the median particle diameter not be greater than about 15µ, expressed on the same basis. 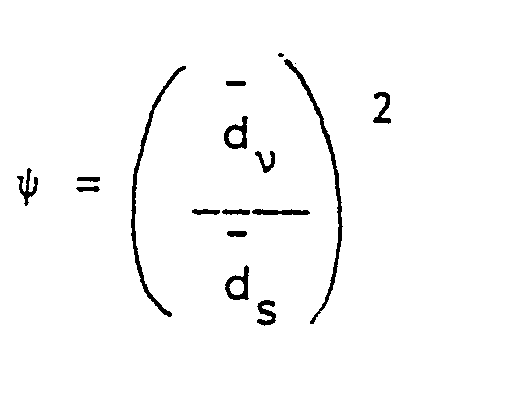 The diameter of a sphere of equivalent volume, dν, for a particle can be determined by a variety of sedimentation tech­niques which are based on Stokes' Law for the settling velocity of a particle in a fluid. Such techniques are described in Stockham, J.D. and Fochtman, E.G., "Particle Size Analysis", Ann Arbor Science, 1978, incorporated herein by reference. where dν is the diameter of a sphere of equivalent volume, supra, and ds is the diameter of a sphere of equivalent area. A technique for determining ds is the BET technique described by Stockham and Fochtman at page 122. Since the sphericity of interest herein is the mean spheri­city, the mean diameters are employed. Other optional components include other suspending agents such as xanthan gum at a level of from about 0.2% to about 5% and shorter chain amides such as mono and diethanolamides of fatty acids having from about 8 to about 14 carbon atoms commonly used in shampoos. Preferred are coconut monoethan­alamide, lauric diethanolamide and mixtures thereof at a level of from about 1% to about 5%. The pH of the present composition is not critical and may be in the range of from 2 to about 10. The shampoos of the present invention can be made by mixing a portion of the surfactant blend, the suspending agent and the silicone together and heating to about 72°C. The mixture is mixed thoroughly for about 10 minutes at the 72°C temperature before being pumped through a high shear mill and then through a heat exchanger to cool it to below about 35°C. The remainder of the composition is added at this time and the total composition mixed. The high shear mill is used to achieve adequate dispersion of the silicone fluid. This is achieved by having the average particle size of the silicones preferably be about 10 microns or less. In the cooling step, the acyl derivative is preferably crystallized into particles having an average particle size of about 10 microns or less. The present compositions are used in a conventional manner for cleaning hair. From about 0.1g to about 10g of a composition is applied to hair that has been wetted, generally with water, worked through the hair and then rinsed out. The following Examples further describe and demonstrate the preferred embodiments within the scope of the present invention. The Examples are given solely for the purpose of illustration and are not to be construed as limitations of the present invention as many variations thereof are possible without departing from its spirit and scope. The following are compositions representative of the present invention. The above compositions are both mild and lather well. In the above compositions other surfactants such as sodium myreth-3 sulfate or TEA laureth-2 sulfate may be used in place of ammonium laureth-3 sulfate. Similarly, sodium myristyl sulfate or TEA lauryl sulfate may be used in place of ammonium lauryl sulfate. Additionally, other silicones may be sued in place of the material shown such as lower or higher viscosities. wherein the molar ratio of ethoxylated alkyl sulfate to alkyl sulfate is from 3:2 to 6:1. 2. A shampoo composition according to Claim 1 wherein the long chain acyl derivative or amine oxide is selected from ethylene glycol long chain esters, alkanol amides of long chain fatty acids, long chain esters of long chain fatty acids, glyceryl long chain esters, long chain esters of long chain alkanolamides, long chain alkyl dimethyl amine oxides and mixtures thereof. 3. A shampoo composition according to Claim 1 or 2 wherein the non-volatile silicone is selected from polydimethylsiloxanes having viscosities of from 5 to 100,000 centistokes at 25°C, polypropylene oxide modified dimethylsiloxanes, silicone gums and mixtures thereof. 4. A shampoo composition according to any of Claims 1 to 3 which in addition contains a mono- or diethanolamide of a fatty acid having from 8 to 14 carbon atoms. 5. A shampoo composition according to any of Claims 1 to 4 which in addition contains an antidandruff agent. 6. A shampoo composition according to any of Claims 1 to 5 wherein the antidandruff agent is zinc pyridinethione. 7. A shampoo composition according to any of Claims 1 to 6 which in addition contains an isethionate surfactant salt. 8. A shampoo composition according to any of Claims 1 to 7 wherein the long chain acyl derivative is an ethylene glycol long chain ester. 9. A method of shampooing hair comprising applying to hair that has been wet with water from 0.20oz. to 1.0oz. of a composition according to any of Claims 1 to 8, working the composition through the hair and rinsing it from the hair. AT88302822T AT80792T (en) 1987-04-01 1988-03-30 Shampoo preparations. EP0525078A1 (en) * 1990-04-18 1993-02-03 Procter & Gamble Anti-lice treatment compositions. FR2694494A1 (en) * 1992-08-05 1994-02-11 Rhone Poulenc Chimie Cosmetic composition containing in suspension water-insoluble particles. TR27771A (en) * 1993-07-12 1995-08-09 Procter & Gamble Soluble non-dispersed phase flow of the conditioning agent on an Improved showing of precipitation, high measurement foaming shampoo conditioner was viewed.